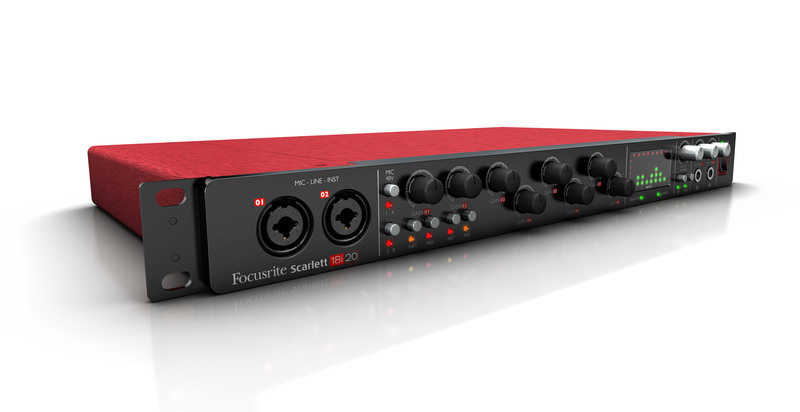 Scarlett 18i20, USB audio interface from Focusrite in the Scarlett series. Product replaced by the Focusrite Scarlett2 18i20. 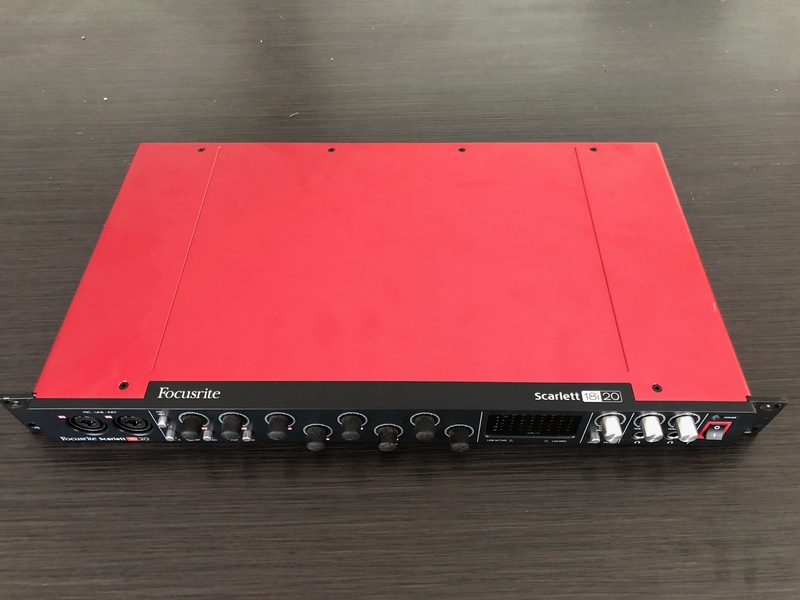 Nonstopbeats's review"Focusrite Scarlett 18i20 review"
The Scarlett-18i20 is an audio device that has a selection of inputs and outputs that can be effectively used to record a band. This device replaces heavy amounts of equipment that may you need in a studio in order to combine the mix and instead finds them all in a single audio interface. The device also has exceptional sound quality and comes with Mic pre-amps that are designed by focusrite and have an award winning sound to back them up. The audio interface also comes with a circuit design that is both analogue and digital and is therefore capable of recording audio at an extremely high quality. 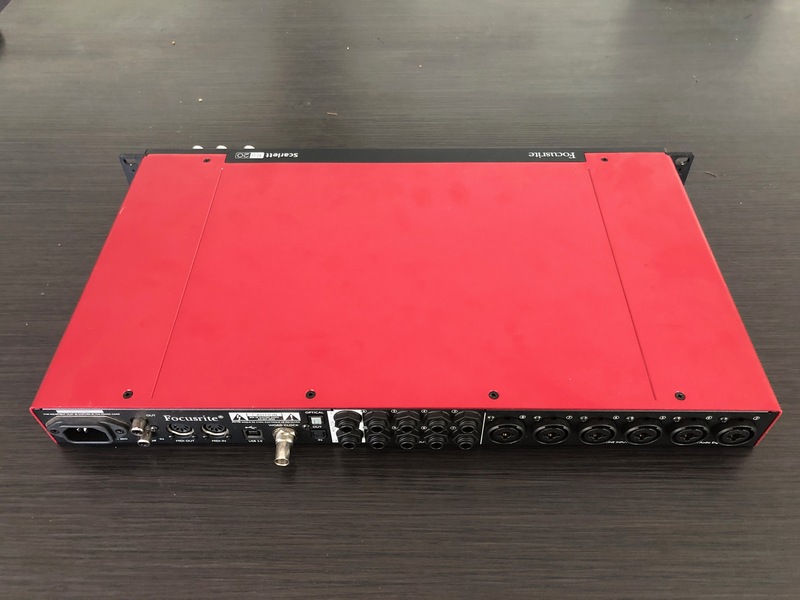 The first thing I noticed about the Scarlett-18i20 was that it had a wide selection of inputs and outputs, as well as many ways in which to tweak the volume of each of the connections. I was able to plug the audio interface directly into my computer easily and effectively thanks to the 2.0 USB connection that it had. I found there to be 18 inputs and 20 outputs. There was also 8 Mic preamps on the device with the ability to switch them to phantom power. The audio Interface also came with analogue inputs that had a combination of XL and jack sockets. As well as this, there are also eight channels of digital I/O which are accessible via an ADAT light pipe. There are also several headphones outputs which allow you the ability to send the mix to several individuals at once. For instance, you could send the sound output to the individual artist, as well as the sound engineer. There is also a section for monitoring and this comes with buttons that you can use to cut the sound, as well as the ability to control the studio monitors that are running from the audio interface. I also was pleased that the audio Interface worked with software such as Abelton live, and it made the process of submitting the audio into the program easier and more fluid. 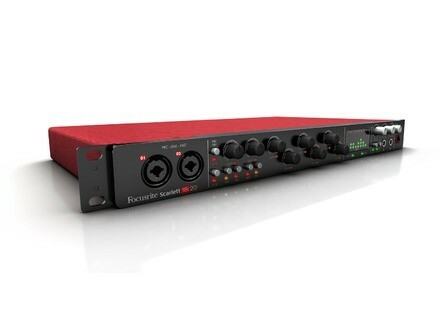 The closest audio interface that you could compare with the Scarlett-18i20 is that of the focusrite Saffire pro 40. 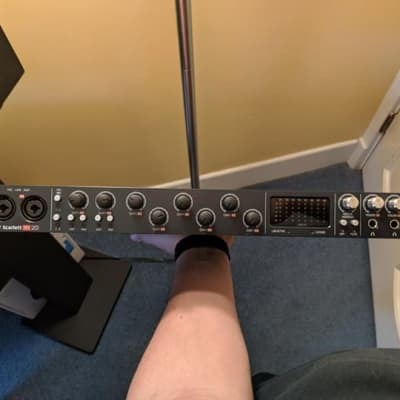 I found the design of the Scarlett-18i20 to be very similar of the Saffire pro 40 and there was a similar amount of inputs and outputs, as well as a selection of control on the gain on the Saffire pro 40 which was similar to that of the Scarlett-18i20. One of the main differences between the two audio interfaces is that the Scarlett-18i20 are continuing to be developed by focusrite, where as the Saffire models have stayed the same over the years, with the input design of a FireWire cable. This type of connection uses less CPU power than USB but is being discontinued by modern computers. This means that they risk being discontinued and may therefore be unsuitable for individuals who are running the latest computer software with which to use the device. This is a very well-designed audio interface with a wide variety of input and output options. I experienced very clean sound when I played guitar softly through the audio interface. However, when I began to play the guitar on a more intense level I found that clipping occurred. This can be an issue and you need to be careful that the volume on the instrument that you play into the audio Interface isn't too loud, otherwise you will get permanent clicking on your recordings and this will be undesirable in most situations. Some individuals have also complained that the Scarlett-18i20 device did not work with their Mac computer and that they had to upload the latest drivers in order to get it working. I did not have this problem but I would imagine that it is not the most difficult procedure to carry out. If you are interested in producing music for a band which uses many different inputs when recording music then a device such as the Scarlett-18i20 will be perfectly suited in a studio environment. The device is also light enough to carry around and this means that you can create high-quality recordings in any location. I recommend the Scarlett-18i20 audio interface for any individuals who have a desire to record music. Anonymous 's review"Stable and good, but the finish leaves a lot to be desired"
I bought this soundcard to have the maximum of inputs and outputs for my home-studio. In this respect, I have nothing to say. The soundcard is very good, you will be limited by the PC, not by the card itself!!! I use it with a UAD twinfinity 710 preamp and dbx 166xs compressor. Simply wow (for a home studio)! Computer: intel core i3 3.10 Ghz, 4GB, running windows 7 64bits. I use it with Cubase 6.5. No issues recording 16 tracks at the same time. I haven't exceeded 16 playback tracks. Problem-free installation. Setup relatively easy (except for the software routing). I took a quick look at the manual. Sorry! I've been using it for 4 months now. I had had four soundcards before. And this one is the best (I only know home-studio quality soundcards). 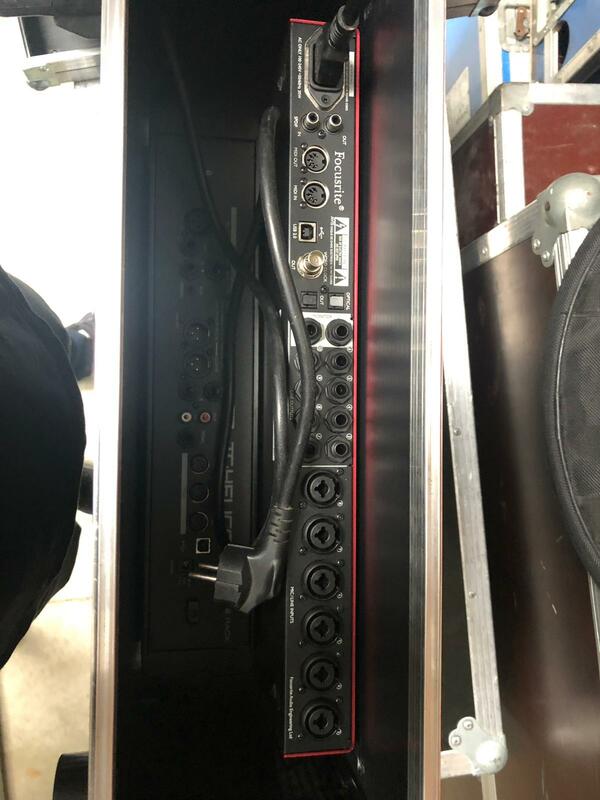 What I like best: Its rack format, that it's internally powered, its performance, its two headphone outputs, its combo jacks on the front, its stability. What I like least: Its finish (slippery volume controls, small and very, very fragile pad, inst and phantom power buttons!!!). I've had two broken and I don't even know why! The technical features that motivated my choice were the number of I/Os, the flexibility in terms of routing, the two independent headphone outputs, which come in really handy, and the 1U rack format. I use the interface with a preamp and my macbook pro 13" early '11 and a pair of Yamaha HS7 as monitors. Especially to record guitars and some vocals, right now, but I will certainly use it for other things later. I use it mainly with Live 9 and Logic pro X. On mac there's no driver as such, so it is very stable. The software included for internal routing isn't complicated and it works fine, with very practical presets. Overall, it's really easy to use. I have never had the chance to record more than 4 tracks simultaneously, but the latency is quite all right. In terms of updates, I must confess that I haven't paid much attention. In the end, everything works fine and without problems. Moreover, it does its job very well, for the price and type of hardware, but you can't expect the same conversion as with a high-end interface. The preamps are all right for the price but they are certainly not the best. But, for the price, it's pretty good. You can do some pro stuff, as long as you have good mics and external preamps. No remarks regarding installation and setup. I haven't even looked at whether it has a manual or not. I've used it for almost six months now and I tried different interfaces at different price points. The most similar was the M-Audio Profire 2626. I think the choice is very subjective, but I prefer the scarlett. It looks nicer, the two jack/XLR inputs on the front are much more practical and I prefer the preamps of the scarlett. Its value for money is all right, even if I bought it at my local store (to pay in installments) and it wasn't cheap. But focusrite are rather nice and offer a small bundle with some virtual instruments and a sample library that isn't bad at all. But it's the hardware itself that is a good deal secondhand. Based on my experience, I would buy it again because it's gear I know I can keep some time before switching to something else. Doctor John's review"Top of the pop, man"
- Which technical specifications motivated your choice? - What do you use it for? To record in a mini-home studio (awaiting more resources to expand), alone or with a band, to keep the settings of each track. - What's your setup (motherboard, CPU, RAM, hard drive,...)? I'm a newbie, so I can't give any specific characteristics. I use it with a Presonus Studio Channel preamp to record vocals. - Are the drivers stable? - What's the latency of your system? Since I don't have a whole orchestra behind me, I have been able to record 4 tracks and play back 8/10 tracks without any problems. - Did you have any problems during the installation? You need an Internet connection to download the driver, after having validated a code. - Did you have any incompatibility problems? - How complicated is the overall configuration? Uh... I haven't opened it. - Which feature do you like the most / the least? The most: everything, really, I'm very satisfied! - Did you try any of other models before buying this one? For such a number of inputs and outputs, it's really a very good value for money. It is true that the preamps aren't of the best quality, but they are far from being bad. Anyway, at this price and given what the 18i20 offers, it couldn't be better. If I had the same budget, without hesitation. 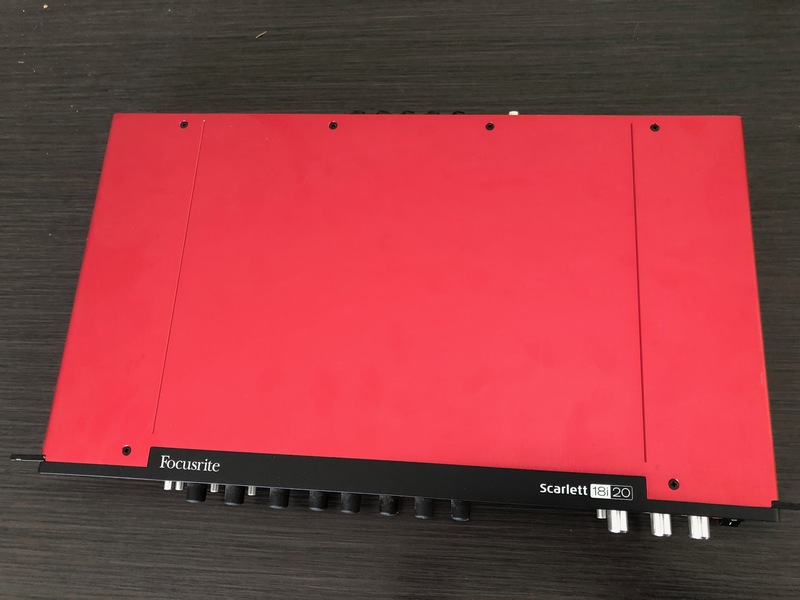 Focusrite is pleased to announce the Scarlett 18i20, the latest in its popular series of USB 2.0 interfaces with 18 ins and 20 outs.